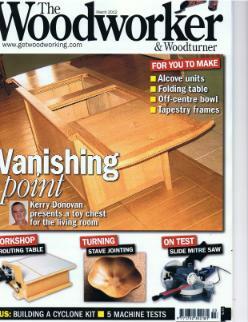 I've had another article published in April issue of The Woodworker. The five-page article with photos, explains how I designed and made the the Three-panel Room divider in Ash. The particular design feature here are the wooden comb-hinges I made. A friend of mine here in Brittany did the upholstery - thanks Andy! The five-page article and 20 photos, explains how I designed and made the footstool for the recliner chair - check it out if you have some time. I've made the front cover again! The recliner chair that features in the banner of this website is featured in the September 2012 issue of The Woodworker magazine (available in WH Smiths and all good newsagents). The six page article (together with 28 photos), explains how I designed and made the recliner - check it out! 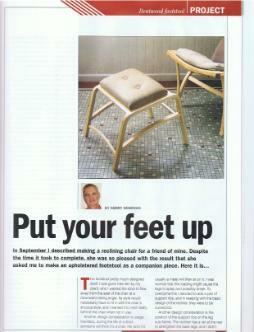 Another article that shows the design and manufacture of the accompanying footstool will follow in a couple of months. The article about the pair of occasional pedestal tables was published, in The Woodworker. 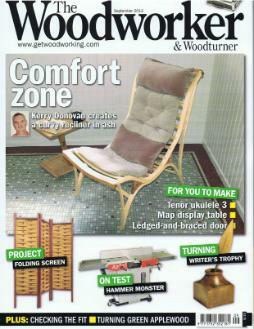 My first article appeared in as a cover feature in The Woodworker. This is the toy-box in Oak and Chestnut made for a young family in London. Front cover of the March 2012 issue of the magazine.